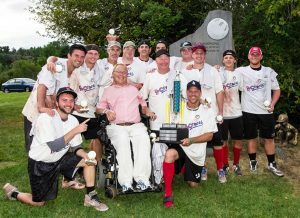 ESSEX, Vt. — Rain and damp conditions failed to hamper the play on the field or the spirit on-and-off it as the 15th annual Travis Roy Foundation WIFFLE Ball Tournament held at Pat and Beth O’Connor’s three backyard fields, Little Fenway, Little Wrigley and Little Field of Dreams was a record-breaking success. 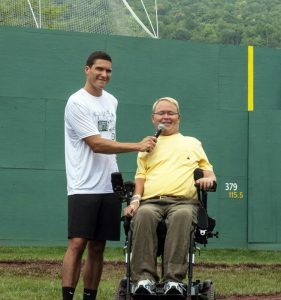 Will Reeve and Travis Roy speak at the 2016 WIFFLE Ball Tournament. The 32-team event held August 12-14, 2016 raised a record $615,024, shattering last year’s previous high of $553,000 to push the 15-year total over the four-million dollar amount. It also marked the third time in the last four years the Vermont backyard fundraiser raised over a half-million dollars. All funds go to the Travis Roy Foundation that benefits and creates awareness for people with spinal cord injuries, and is named after the former Boston University men’s hockey player who resides with his family in nearby Malletts Bay in Colchester each summer. Roy, along with Will Reeve, spoke at Saturday’s inspirational ‘money count’ ceremony on how the funds provide hope and assist those affected with spinal cord injuries. Reeve, the son of Christopher and Dana Reeve and currently an on-air personality at ESPN, is a director of a similar foundation named to honor his late parents. The 2016 Travis Roy Foundation WIFFLE Ball Tournament champions. The Buckners, who held off the Boston Terriers, 3-2, in a thrilling hard-fought contest in Sunday’s championship game, won this year’s tourney. The two longtime participants were each making their first title game appearance and the Essex-based Buckners are the first champions from Vermont since 2004. Ryan Young of Essex Junction, VT was named the tournament MVP for his clutch hitting, base-running and defense in leading the Buckners to its first title. Other annual award winners were Kirk Fontana of Williston, VT and HOTDAM earned the Tommy Long Sportsmanship Award; Wolfeboro, NH-native Allie Skelley of the Blue Bulls picked up the Kim Trahan Fundraising Leadership Award; longtime tourney event coordinator Sue Bentlage of Jericho, VT was this year’s Little Fenway Hall of Fame inductee, and the Boston Beef won the Fan Club Award as the top fundraising team for the 10th straight time, raising over $70,000. The tournament began Friday with the opening ceremonies and the annual Celebrity-Sponsor game. In addition to Reeve who also played in the tournament, other notables on hand over the weekend were former UVM hoop standout Taylor Coppenrath; former LPGA tour golfer and UVM basketball star Libby Smith; former Spaulding High and UNH football star David Ball; noted baseball historian and author Glenn Stout; former Boston and Montreal pitcher Bill Lee; Florida Panthers draftee Ben Finkelstein of South Burlington; local media members Alex Abrami of the Burlington Free Press, Mike McCune and Scott Fleishman of WCAX TV, Steve Cormier of RadioVermont and Ken Drake of WPTZ TV; and WIFFLE Inc. CEO Dave Mullany, the grandson of the inventor of WIFFLE Ball.